If Netflix offers HD streaming of a TV show or movie—you’ll see a little ‘HD’ box in the upper-right corner if it does—you can now enjoy that higher-quality streaming on an iOS device. This should come as particularly welcome news to those with Retina iPads. HD and AirPlay, oh my! The other big change is AirPlay support. 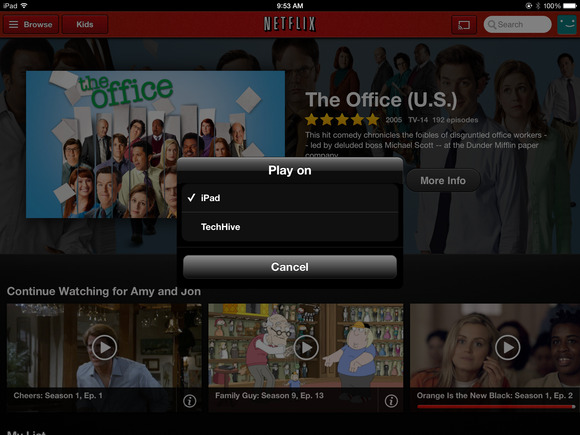 In the past you could enable AirPlay Mirroring on your iOS device to send Netflix video to your Apple TV. The latest update adds true AirPlay support, with which you can start playing Orange is the New Black, tap the AirPlay icon, and choose an Apple TV to stream to. That also means full playback/audio track/subtitle control, lock screen accessibility, and being able to do other things with your iPad while you stream to your Apple TV. Of course, you may ask yourself why you’d use AirPlay when the Apple TV already has a native—and music better—Netflix app built in. And you’d be right to ask. The only time I’d see AirPlay as an essential feature for the app is when you want to watch via an Apple TV that isn’t your own and doesn’t have a Netflix account associated with it. If you’ve already updated to version 5.0 of the app and you don’t see these features in action, you’re not crazy, just unlucky. Netflix says that the features will roll out to all members by mid-October, presumably tied to your Netflix account.